War mostly consists of trying to manage the monotony of day-to-day existence until something happens. This was truly the case for elements of the U.S. Army’s 30th Division during World War I in France. They would train during June and July 1918 in preparation for the major campaigns they would encounter in late summer through November 1918. Constant drilling, constant moving camps, constant gas drills, constant sanitation practices, constant marching, and constant reports of wounds and deaths would become the lot in life of North Carolinians during this period. All of the 30th Division’s infantry units had to document every day and note everything that occurred in war diaries or war journals for the U.S. War Department. Mundane to magnificent, it did not really matter. The point was to keep track of the necessities and movements of all of the units as they were training, working with the French and British Armies, and to have a record for the future. 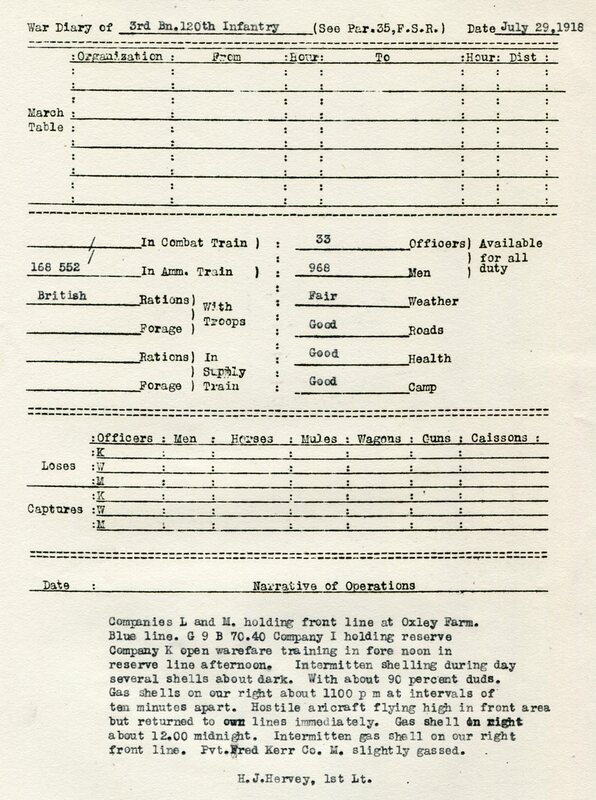 The 120th Infantry, 30th Division, kept a daily war journal, with each of the separate subunits of the regiment reporting on single, typed sheets as to their movements and activities for the given day. The content is often one line of text or less, or even a few words. Sometimes, it is one of two paragraphs. The length of the content is not as significant as is seeing the frequency of the activities, the severity of the activities, or the simple observations that can be determined from the more mundane parts of the reports. For example, on July 7, 1918, the 2nd Battalion of the 120th Infantry reported that all units of the battalion except for one bathed together. Bathing was less frequent due to battlefield conditions, lack of clean water, or the difficulty of getting soldiers to coordinate their activities to keep enough men battle-ready. It is easy to take bathing for granted, but in a trench war like WWI there were fewer chances for soldiers to bath. The report also indicates the chapel service being held, which interestingly happened after the bathing. 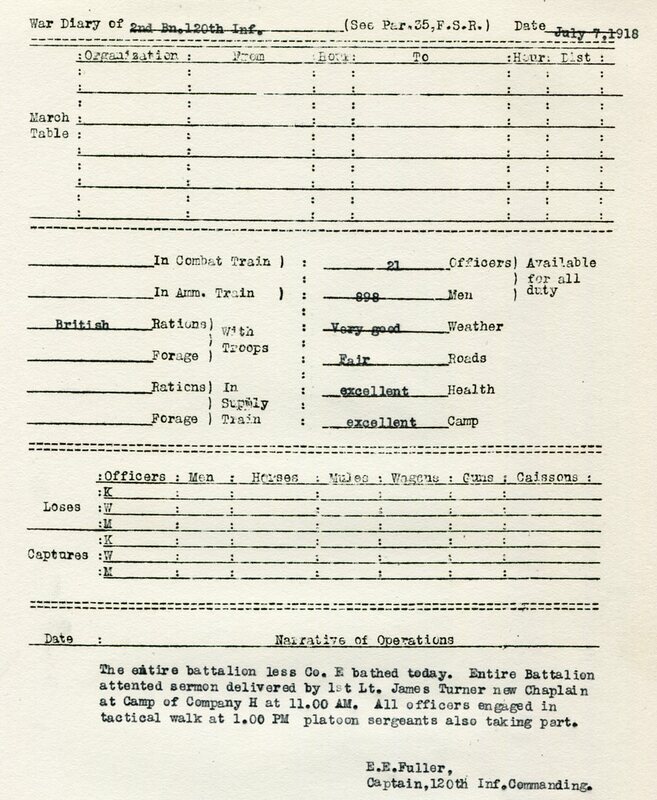 In the July 11, 1918, report, the 2nd Battalion of the 120th Infantry was engaged in the more typical activities of daily camp life: an hour of instruction in military gas exposure and usage; physical exercise; practicing bombing; and preparing trenches in a forward area in order to occupy them if needed in an attack. The most unique thing of this day’s report was the mention of the sanitation in the camp location, and how the camp’s Army surgeon supervised the cleanup of the camp to meet Army sanitation standards. Without this attention to sanitation, more men would get sick, food would be at risk from disease, pests would be attracted to the camp, and waste would amass throughout the camp. 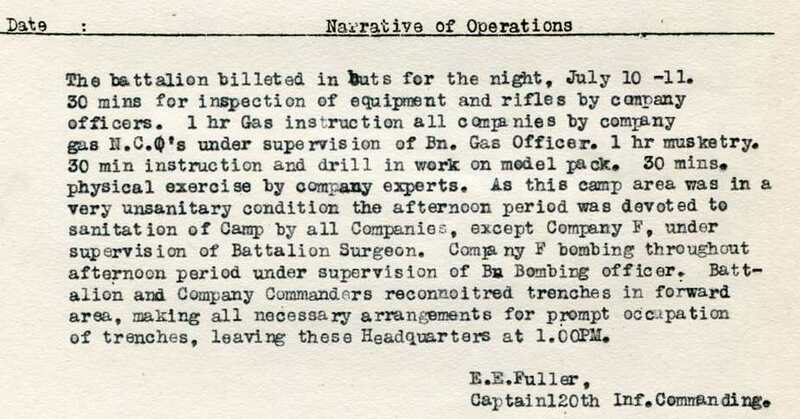 The report for July 16, 1918, notes simply the move of the 2nd Battalion to a new location. However, as pops up frequently in this war diary, the documentation of a man being wounded in the neck from shrapnel is included. Men were injured for numerous reasons before the 30th Division began getting involved in the heavier fighting; however, bullet and bomb wounds became more frequent as the division’s units moved closer to the front lines. The July 21, 1918, diary entry of the 1st Battalion of the 120th Infantry notes the establishment of the battalion headquarters in Belgium in the area of Poperinge, just west of Ypres, Belgium. The care to establish the battalion defenses is clear in the report. By the report for July 29, 1918, the 3rd Battalion of the 120th Infantry found itself being shelled during the day and night, and German aircraft flying overhead behind the Allied lines throughout the night. The 3rd Battalion was hammered with chemical gas shells throughout the evening into the next morning, with one private being reported to have been gassed. These war diary entries bring home the fact that war is not about glorious forays into the enemy’s gunfire, or actions that garner people medals and recognition from their fellow soldiers. War is about surviving, and preparing to survive. Such was the experience of the 120th Infantry in July 1918. These experiences and reports become more eventful and graphic as the war progresses closer towards November 11, 1918--Armistice Day. To learn more or when the rest of the 120th Infantry's WWI war diaries, you can view them in-person in the Search Room of the State Archives of North Carolina in the WWI Papers of the Military Collection.